As Donald Trump prepares to announce his long-awaited decision on the Iran nuclear agreement, more Americans say they disapprove (40%) than approve (32%) of the agreement, with about a quarter (28%) offering no opinion. Opinions about the agreement are less negative today than in September 2015 and about the same as in July of that year, shortly after the agreement was announced. With a number of major stories vying for the public’s attention, relatively few Americans (27%) say they have heard “a lot” about the 2015 agreement on Iran’s nuclear program between Iran, the U.S. and other nations. Nearly half (46%) say they have heard “a little” about the agreement, while 26% say they have heard “nothing at all” about it. The latest national survey by Pew Research Center, conducted April 25-May 1 among 1,503 adults, finds that fewer than half (42%) say they are very or somewhat confident in Trump’s handling of the situation with Iran; 52% say they are not too confident or not at all confident in him on this issue. Republicans and Republican-leaning independents are somewhat less negative toward the Iran nuclear agreement than they were in 2015, after it was reached. Currently, 53% of Republicans and Republican leaners disapprove of the agreement, while 22% approve. In both September and July of 2015, larger majorities of Republicans disapproved of the Iran agreement (73% in September, 69% in July). By contrast, opinion among Democrats and Democratic leaners is little changed from 2015. As was the case then, fewer than half of Democrats (43%) approve of the agreement, while 30% disapprove. About a third of Americans (34%) say they are not confident at all in Trump’s handling of the situation with Iran, while another 18% say they are not too confident. About four-in-ten (42%) are very (24%) or somewhat (18%) confident in Trump on this issue. Across most issues, with the exception of trade and the economy, more have little or no confidence in Trump than say they are at least somewhat confident in him. As with views of Trump’s handling of other issues, confidence in the president on Iran varies widely across partisan groups. About eight-in-ten Republicans and Republican leaners say they are very (54%) or somewhat (29%) confident in Trump on Iran, compared to about one-in-ten Democrats and Democratic leaners (11%). About half of Republicans are very confident (54%), while over half of Democrats (57%) are not at all confident. A large majority of liberal Democrats (75%) say they have no confidence at all in Trump’s handling of the situation with Iran. A somewhat smaller majority of conservative Republicans (63%) say they are very confident in him on this issue. Overall, most of those who approve of the Iran agreement have little or no confidence in Trump’s handling of the situation with Iran: 48% have no confidence at all in him, while another 17% have not too much confidence. Among those who disapprove of the agreement, about half (52%) are very or somewhat confident in Trump’s handling of the situation with Iran; 43% have little or no confidence in him on this issue. Overall, 27% of Americans say they have heard lot about the 2015 nuclear agreement between Iran, the U.S. and other nations, while 46% say they have heard a little about it; 26% say they have heard nothing at about the agreement. In September 2015, after the Iran agreement was reached, somewhat more (36%) said that they had heard a lot about the agreement. Young people, as well as adults with no more than a high school education, are among the most likely to say they have heard nothing about the Iran deal. Nearly four-in-ten of those under 30 (38%) say they have heard nothing at all about the Iran nuclear agreement, while 45% have heard a little and just 17% have heard a lot about it. Among older age groups, no more than about a quarter say they have heard nothing about the issue. And while 45% of adults with a postgraduate degree say they have heard a lot about the Iran agreement – and 40% of those with a four-year degree say the same – smaller shares of those with some college experience but no degree (30%) and those with no more than a high school diploma (15%) have heard a lot about the agreement. Republicans are somewhat more likely than Democrats to say they have heard a lot about the Iran nuclear agreement (35% vs. 23%). About a quarter in each party (26% of Democrats, 22% of Republicans) say they have heard nothing at about it. 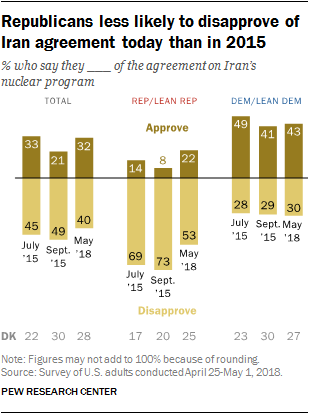 The balance of opinion about the Iran nuclear agreement among the minority of adults who have heard a lot about it is similar to views among the overall public: 53% disapprove of the agreement, while 45% approve. Opinion is divided among those who have heard a little about the deal (38% disapprove, 37% approve). Most of those who have heard nothing at all about the agreement express no opinion (59%); among those who offer an opinion, more disapprove (30%) than approve (11%).